We all need a food hug sometimes. I know, I know. I’ve been eating my weight in watermelon and now I’m trying to serve you SOUP. It’s not exactly soup, at least I don’t consider curry or noodle bowls to be soup. But I make no sense of anything at all ever, so perhaps you shouldn’t listen to me. In my confusing secret brain I consider curry and noodles to be warming comfort food, exactly what’s needed when the rain is pouring down outside and jackets are still necessary. And when you need the hug. The words that come to mind when I look at this curry? Rich. Warm. Inviting. Spicy, but in a good way. Soulful. Hearty. But light! And VEGETABLES. Because green things. See them? 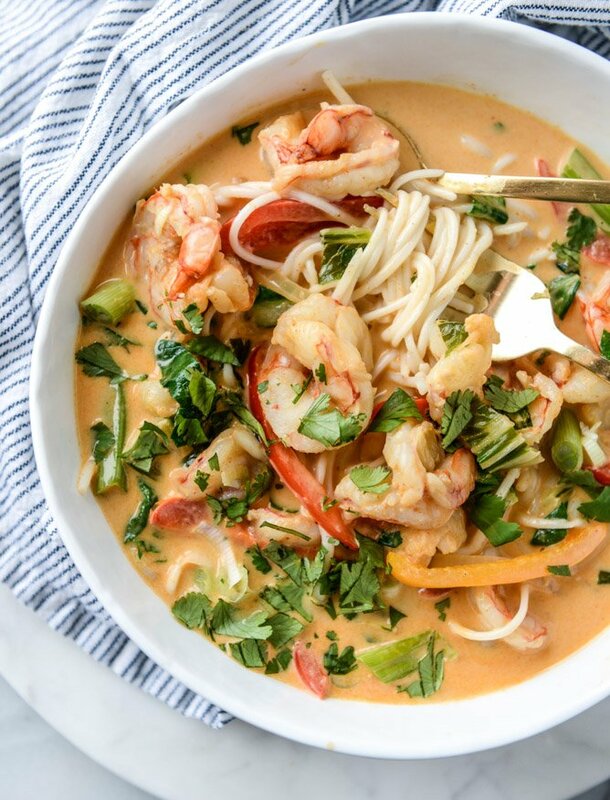 Oh coconut curry, how I freaking love you. It’s no secret that I would drink coconut milk straight from the can if asked (and maybe I do sometimes – or at least pour it into my coffee) and when it’s stirred into red curry paste, creating pretty red swirls until it turns all shades of pink and orange, studded with bright greens and juicy shrimp and slightly crisp peppers, I love it even more. I swear that canned coconut milk was made for me. So this dish! Um, hi, it’s super easy. Like SUUUUUPER easy. Like if you’re familiar with your kitchen, it will be done in 30 minutes. If your shrimp is peeled and deveined, possibly even quicker. I stirred some of Trader Joe’s fresh rice noodles into my bowl and loved it. Then I googled the TJ’s rice noodles and found horrific reviews of them. I don’t know man, they were pretty delicious to me. The good news is that you can use whatever noodles you’d like! Spaghetti, dry rice noodles, soba noodles – whatever. If you don’t want to use noodles at all, you could serve this over rice or stir in some roasted sweet potato wedges. And then watch the rain fall down outside and read a fabulous book. And then wine. And maybe affogato. This is turning into the best night ever! 6 ounces cooked rice noodles, or soba noodles… or spaghetti! Heat a large skillet over medium heat and add 2 tablespoons of the coconut oil. Add in the shrimp and cook until opaque and pink on both sides. Sprinkle with salt and pepper Remove the shrimp and place it in a bowl off to the side. Add the remaining coconut oil to the pot. Stir in the onions, peppers, more salt and pepper and stir to toss. Cover and cook until the vegetables have slightly softened, about 5 minutes. Add in the garlic, ginger and curry paste and stir to coat. Cook for 5 minutes, stirring occasionally, scraping the bottom. Add in the snap peas and coconut milk. Increase heat and bring the mixture to a boil, then reduce the heat to low, cover and cook for 5 minutes. Stir in the shrimp and cilantro and cook for 5 minutes more. 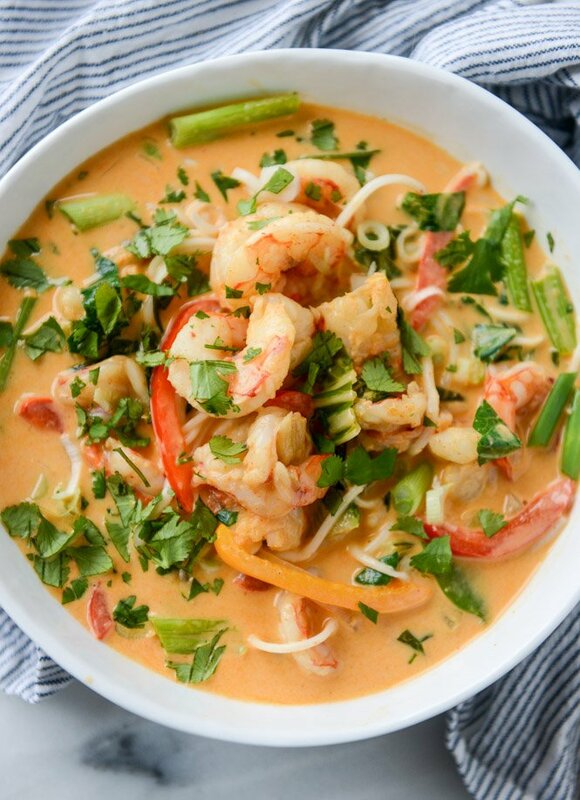 To serve, place a handful of rice noodles in a bowl and cover with the shrimp curry. Top with extra cilantro or green onions. This is like,…..date night dinner or something equally romantic. Oh wait. Anyhow. It looks delicious and I’m taking your word for it that it is easy! It doesn’t look like an “easy” dish. It looks complicated which mean really really tasty. I like your idea of adding sweet potato wedges. Oh yum. And oh my, I’m with you on eating my weight in watermelon everyday. I eat one almost every single day. But then I’ve read they have 1300 calories in a watermelon, oops. I, too, love anything with coconut milk. Especially savory dishes like this one! 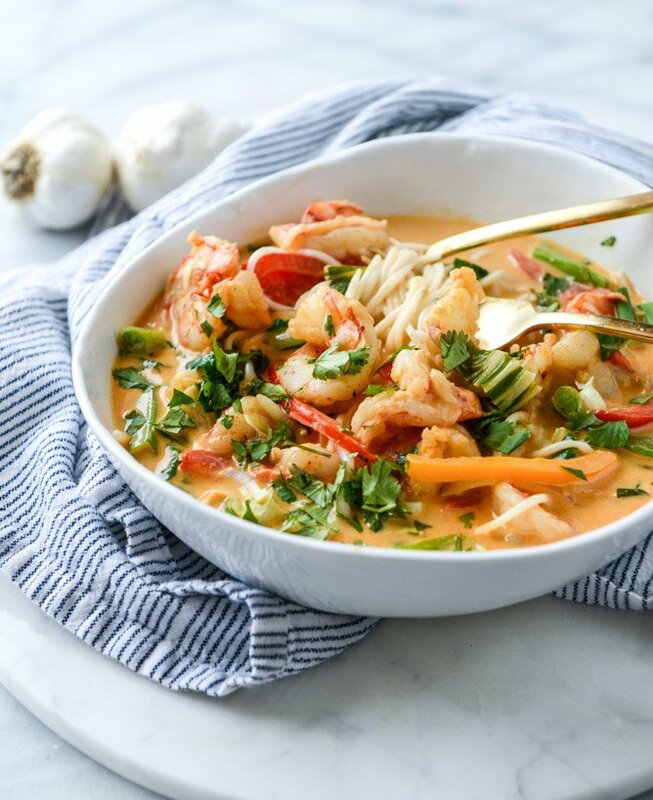 Thai coconut curry happens in our house at least once a month during the colder months. The spring weather around here has NOT been cooperating, though, and this looks like the perfect answer. Couldn’t agree with you more – Noodles are the best comfort food! These look so so SO good right now! It’s an icky, dreary day today and I really want to dive into one of those bowls for lunch. 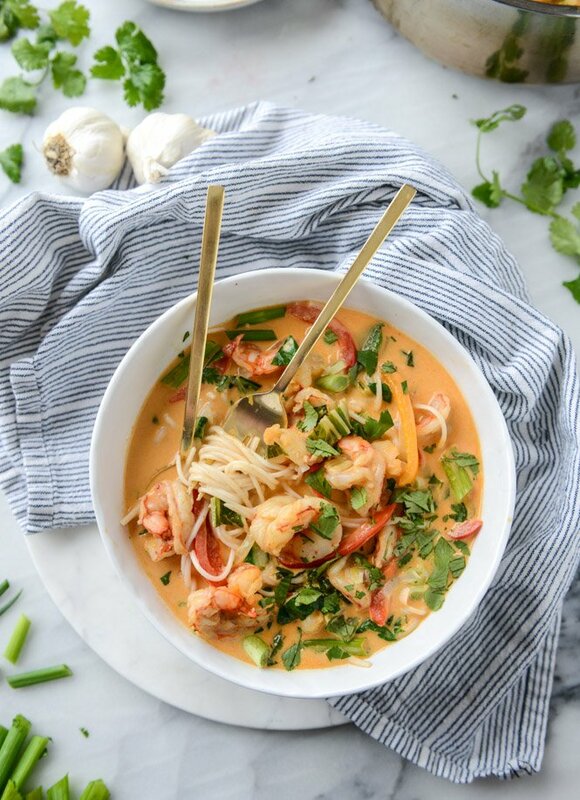 My sister is a huge curry-lover, I cannot wait to make this for her! I cannot WAIT to try this! It is going on my must-make-close-to-immediately list! This looks amazing! My husband won’t eat shrimp. I would devour the shrimp but would chicken substitute well? I really thought I was the only person that would eat something delicious and then google it to see what the internets said. I’m so glad you do it too! This is why you’re my favorite food blog! Ughhhh this is everything I’ve ever wanted and more. Coconut curry is my FAV. Well, coconut anything is my fav, but especially curry. So good. I also hate when I google something that I love and then see that everyone else hates it…it seriously makes me question my opinion, which is dumb! Hello! I was wondering if you could substitute chicken for the shrimp. Also, since I’m here commenting, just wanted to say thank you for all your foodie words and pictures. You’ve been such an inspiration for me! I love what you do with food and I check your website all the time to make sure I haven’t missed anything. Thank you. YUM! 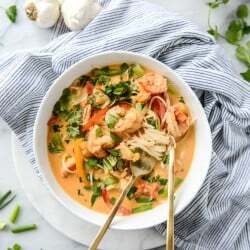 I’m a huge fan of curry with rice noodles, but I’ve been nervous to try adding the noodles to my curries without a recipe. THANK YOU! I can’t wait to try this out. For some reason, I keep imagining Tom Yom (probably because they both have shrimp). I love soup/noodle mixes because they’re just what you’ve describe – a hug. Everybody needs a hug! This looks great! I’m wondering what red curry paste you use. I have tried a few but am not in love with any of them. Thanks! I love this recipe! It has so many of my favourite ingredients in it. I love how colourful and fresh it looks. Thanks for sharing. hey girl this looks oh so good! 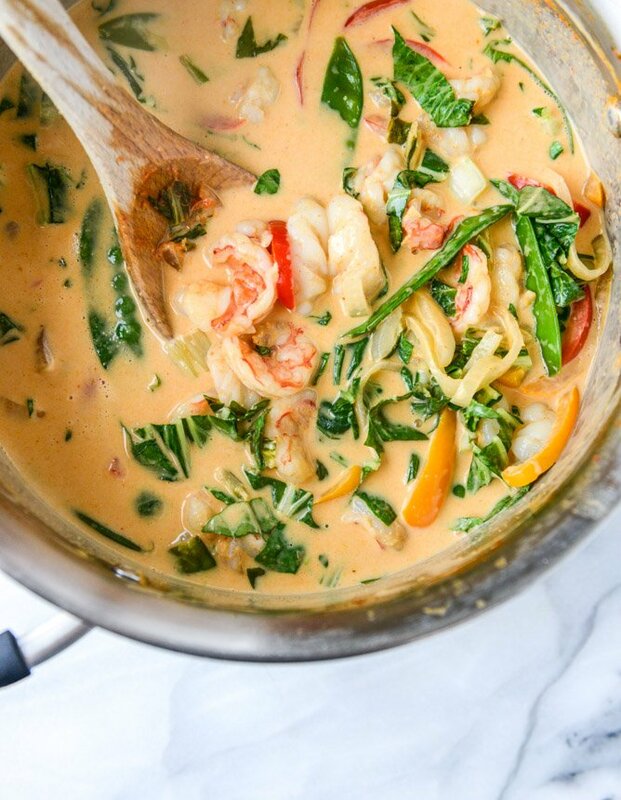 Shrimp + curry + noodles = I’m in!! This looks amazing, Jess. You just cured my years long depression over a local Thai restaurant that closed and served something almost identical to this. I could never make it come out right, but THIS is an exact match–except for the snap peas. Amazing recipe. Thanks for giving me back one of my favorite dishes and saving me $$, too. That looks so delicious! I definitely don’t cook with coconut milk nearly often enough! Wow, that looks so freakin’ good!!! This looks SO incredible! Can’t wait to try it!! Hahah you are hilarious. I eat my weight in watermelon this time of year, too. And I totally agree, this is not soup!! lol But what it is is GORGEOUS! Need!! Ok this just looks awesome! Love curries especially with prawn. Thanks for sharing! This was delicious. I added shiitake mushrooms and served with siracha. Next time I will add more curry paste and some red pepper flakes to boost the heat. Thanks for a great recipe! I just made this for my husband and I and OMG it was AMAZING. 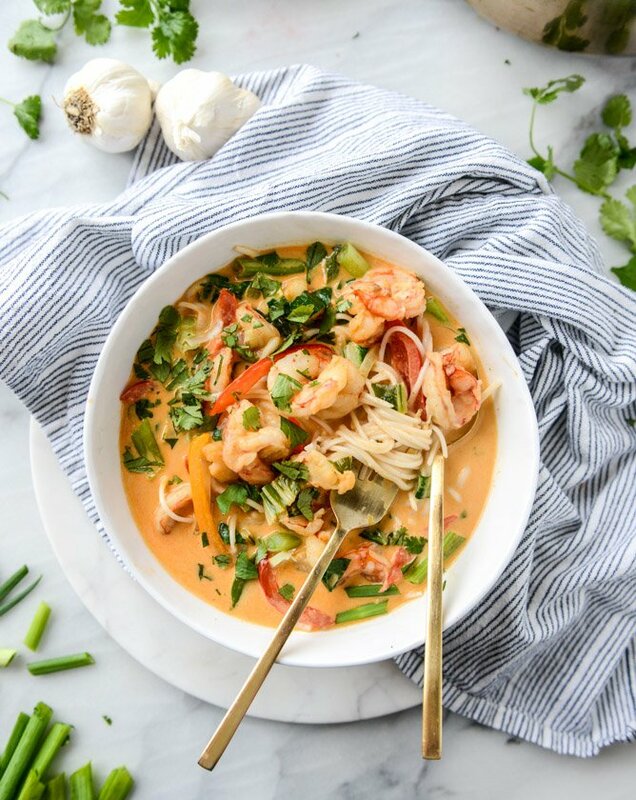 I substituted chicken for the shrimp and used white rice instead of noodles, and it was out of this world. I could basically just drink this sauce/broth. My husband looked skeptical when I told him what it was but he could not. stop. exclaiming how much he loved it while we were eating. This is a winner! This was in a MAJOR win in my house tonight. Thank you for making me look good in the kitchen on this, any many other, busy week nights! The rain came further east. Now I need a food hug. This looks amazing! Amazing!! Made this tonight and it is absolutely delicious. Topped with thin sliced jalapeño. Thanks!! My husband does not like shrimp but I love it. What can I add to this for him to enjoy while I get the shrimp? Chicken? Lump crab (would have to be from the can)? Fish? This looks so good. I showed it to my coworker and she’s already planning to go to the grocery store for ingredients. Update: I spoke to mum about this and she recommended a crab leg would add lots of yummy flavour. Husband agreed to chicken being added so I might add both or if crab leg is too costly just the chicken with the shrimp. So amazing! Huge hit at our house, even with the 3 year old! Had my friend over for dinner last night and we made this :). Added leftover rotisserie chicken for my husband (the shrimp hater). My friend added white wine in the red curry paste stage because the smell was so strong. I thought the flavours were subtle but delicious! Loved that it was something different then our usual dinner. Thank-you for the recipe :). Made this tonight with my 16 month old – who woke up at 4:30am – attached to my hip so took a bit longer than anticipated, but was worth it! Added roasted sweet potatoes too. Was overall really easy, even hubs ate all the veggies! What are your thoughts about this recipe with zoodles?? I think it could be pretty yummy! yessss i think it would be fantastic! Thanks a lot for this Delicious recipe! My family was thriiiiiilllleddddd! I made this last night and it was delicious but mine did not come out that pretty! I used a dutch oven to cook – maybe my veggies got a little burnt? Any suggestion on what to do to make it look pretty? Maybe a different red curry paste? What kind do you suggest?